The Westmead Institute for Medical Research (WIMR) team in action. WIMR research assistant Katie Fisher and PHD students Hafsa Rana and Jake Rhodes are working around the clock to find a cure. Westmead Hospital has taken its urgent search for a Maroonitis cure to the big guns in town: the Westmead Institute for Medical Research (WIMR). More than 40 individuals have presented to Westmead Hospital’s emergency department in the past fortnight with the condition, which is caused when NSW-based individuals support QLD in the Origin series. Most of the affected patients were rushed to the hospital via Ambulance after game one. They showed maroon spots, high blood pressure, colour blindness and heart ache. Jim Skidmore is one of the patients who has been affected by maroonitis. Westmead Hospital’s emergency department director Dr Matthew Vukasovic said help was required by the best researchers in Sydney to cure the condition. “This condition is easily avoided by taking off the maroon jersey and throwing it in the bin,” Dr Vukasovic said. The researchers at WIMR have been working around the clock hunting for a cure, with a bright blue formula looking promising. 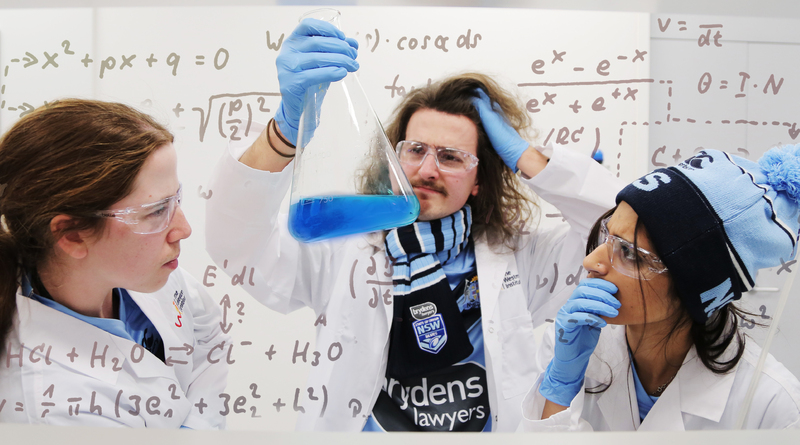 WIMR research assistant Katie Fisher and PHD students Hafsa Rana and Jake Rhodes are experimenting with a blue liquid which could cure maroonitis. The formula would be injected directly into the veins, curing the individual of Maroonitis. The only side effect so far is a painful cramping feeling in the abdomen when QLD scores a try. Dr Vukosavic wishes the team at WIMR all the best with the search for a cure. “I look forward to hearing from the fantastic team at WIMR,” Dr Vukasovic.